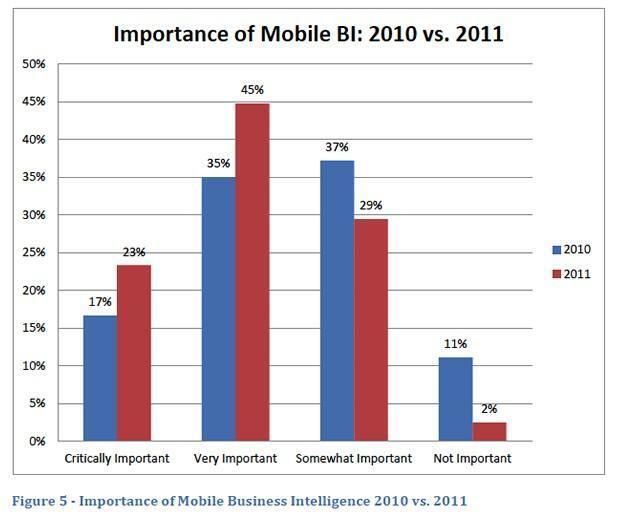 Mobile Business Intelligence (BI) is not a new concept. Many analyst firms have espoused the potential for mobile reporting and analytics to boost the productivity of constantly on-the-go executives, on-the-road sales teams and customer service professionals. In fact, Dresner Advisory Services’ Mobile Business Intelligence Market Study series reported that 68 percent of enterprises viewed Mobile BI as either a “critical” or “very important” part of any analytics initiative. And that was back in October of 2011. The difference now, according to research and advisory firm Ovum, is that a number of critical developments in the BI and analytics marketplace have now enabled that interest to transform into action. Specialist Mobile BI analyst, Gartner’s Joao Tapadinhas, recently echoed Ovum’s sentiment, predicating that Mobile BI users would constitute over 30 percent of the number of overall BI users, worldwide, by 2016. This latest study of the Mobile BI landscape by Ovum provides a detailed evaluation of the latest Mobile BI products from 12 market-leading vendors, including Yellowfin. According to an official media statement issued by Ovum, detailing key report findings, three mid-sized vendors, one of which is Yellowfin, are “leading the charge with feature-packed yet functional mobile solutions”. Ovum also reported that Yellowfin was one of only three vendors to offer “clients for all operating systems”. Tunvall – the report’s author – stated that Mobile BI had the potential to significantly increase overall BI user adoption rates, and enable a considerably wider audience with the fact-based insights gleaned from reporting and anatlyics. Ovum’s report found that while all 12 vendors included in the study supported the iOS platform, followed closely by Android (90 percent), there was only limited support for BlackBerry (50 percent) and Windows (33 percent) devices.